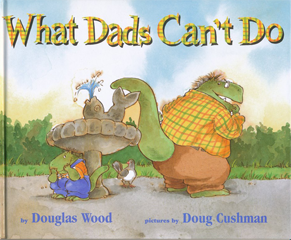 There are lots of things that regular people can do but dads can’t. Dads can’t cross the street without holding hands. They can push, but they can’t swing. When dads play hide-and-seek they always get found, but they have a hard time finding you. Dads really need to be kissed good night at bedtime. It’s a wonder they make it through life at all!